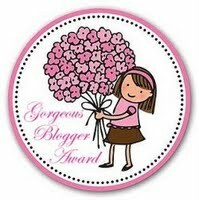 Our Sister-Friends down at the Georgetown Visitation Monastery in DC, have nominated us for the "Gorgeous Blogger Awards". Could we refuse? 1. Our deceased Sister, Sr. Mary Hyacinth, was the cousin of M. Catherine Aurelia, foundress of the Sister Adorers of the Precious Blood. 3. The marble columns holding the baldacchino over the altar and the doors from the vestibule into the extern chapel come from the cocktail lounge of the original Waldorf Astoria! 4. One-third of our community is currently in formation! 5. Up until 2 years ago the annual report and budget were written in the orginal account book started in 1919. The bursar would read from this book at the time of the annual report. With a few turns of the page (well, more than a few), she could tell you what we paid for coal in 1919 and what we paid for gas in 2007! 6. Amazingly, our community does NOT know every hymn in the Summit Choirbook. Six Blogs we think are Gorgeous! 1. Elizabeth over at the Anchoress! 2. Esther, the NJ mom in Hawaii! 3. Diane at Te Deum Laudamus! 4. Julie at Adoro Te Devote! 5. Sr. Roberta at Running with the Lord! 6. The Nuns at Mississippi Abbey!